Product #16373 | SKU SBE-27BK | 0.0 (no ratings yet) Thanks for your rating! 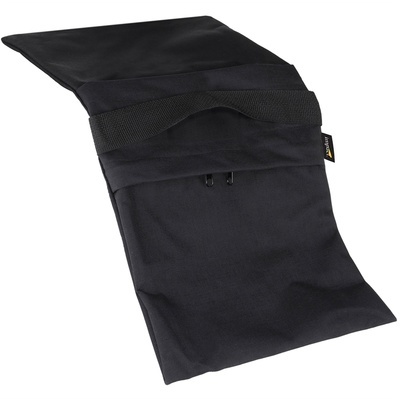 This Impact 27 lb (12 Kg) Pro Sandbag Kit is a set of 6 black, double zippered bags that ship empty to allow you a choice of weighty material and to save on shipping costs. Impact Sandbags come in a variety of shapes and weights. A staple of any studio or location shoot, their saddlebag design is ideal for draping over light stand and C Stand legs. The strong webbed handle makes transporting easy and allows you to hang the bag from a hook or arm. The sandbag weighs 12 Kg when filled with sand and ounces when empty. This Impact Empty Saddle Sandbag - 27 lb (Black) has two wings, to allow draping over light stand legs. Each side of the bag has a hand strap for easy handling and hanging on hooks. This is an empty sandbag, with a double zippered closure. Fill it with sand or small rocks upon arrival at location, and empty it at the end of the shoot -- no heavy shlepping or high shipping expenses. Outer shell is water resistant, heavy duty cordura nylon, inner shell is gauge polypropylene. Handles on both sides are heavy duty polypropylene with a military style sewn box and cross for extra strength.